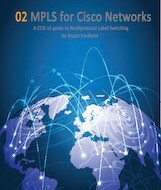 MPLS for Cisco Networks builds up a full MPLS network, utilizing a core MPLS network and several customer sites. You will learn how to use OSPF, EIGRP, and RIP at the customer sites and redistribute them through the provider network. Learn how the routers swap labels, and how to control this, how to implement MultiProtocol BGP within the provider network, and how to set up VRFs (Virtual Routing and Forwarding) to segregate and combine (leak) routes across the network. 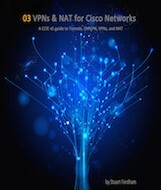 The book also covers VRF-lite, layer 2 VPNs, such as L2TPv3, AToM and VPLS, as well as IPv6 technologies such as 6VPE, and 6PE. There is also a troubleshooting lab at the end of the book so that you can test the skills you have learned. This is the second book I wrote in the series. It is recommended that you have some familiarity with BGP – so check out BGP for Cisco Networks. 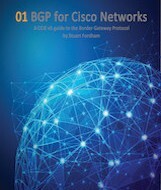 You can see that Steve left the same review for the BGP for Cisco Networks book. I am glad that it helped him to pass his CCIE. Shaun also left a very similar review. Many people have bought all three volumes! 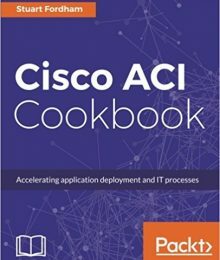 If this has whetted your appetite to learn MPLS, whether for the CCIE, CCNP, CCNA or just to learn, then you can purchase it from Amazon.